We offer a fresh selection of cash and carry bouquets every day! Favorites include roses and mixed flower bouquets. Watch for seasonal bouquets, too. 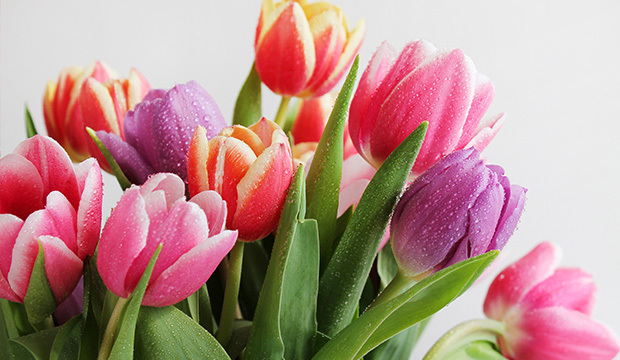 Prices are kept low so you can have fresh flowers in your home or office every week! Green and blooming plants bring cheer to your surroundings at home or at work. Hansen's IGA has an everyday selection in all price ranges as well as seasonal choices such as tulips, daffodils, Easter Lilies, outdoor hanging baskets, hardy garden mums, and poinsettias. Growing plants also make great gifts! Feeling a bit more whimsical than flowers? Try a balloon bouquet! Available as a single balloon or in groups, balloons come in designs that are great for adding a light touch to a message. They make great decorations at birthdays, graduations, garage sales, and many other occasions. Attach a card for a special get well soon gift or to celebrate a baby's birth. We can tie one to a gift basket to give someone you know a truly festive surprise! At Hansen's IGA, our gift baskets are available in almost endless variety. That's because, in addition to all the flowers, gifts, and accessories we have in our department, all the resources of Hansen's IGA are at hand to make your gift basket truly special. We can develop any theme you want with wines, treats from our bakery, fresh fruit from the produce section, snacks from the deli, hams, turkeys, or steaks from our meat department, and even bath and beauty products from the grocery aisle. Access to any combination of spirits, foods, flowers, and gifts allows you to express your creativity.